Guts Casino is one of a number of new and exciting online casinos that have only recently entered the marketplace. In fact, they opened their doors to the public in 2010 but since then have gone on to be a great addition to what’s an increasingly tough environment for most. Whilst a relatively young casino, the brand actually have a more than experienced team behind them, with personal acquisitions from a number of already established online casinos. The team actually resides from MT SecureTade Limited, who own a number of already successful casinos, giving them a strong stepping stone towards their success. As we have mentioned, Guts Casino is owned and run by MT SecureTrade Limited who own a number of other online casinos. Whilst this is the norm for all casinos, it’s not an uncommon ploy for a company to own several brands and in turn be able to offer up a number of casinos spread across a network. The company are based in Malta and are also licensed and regulated by the Malta Gaming Authority. This allows them to work with a number of countries to provide players a safe and secure casino environment to play in. What many people may not be aware of is that Guts has in fact won several awards for their dedication to player safety and also as one of the most innovative ‘new’ casino brands in 2013. These are often sought after awards, so it highlights just how successful the brand has become to be able to receive these awards. 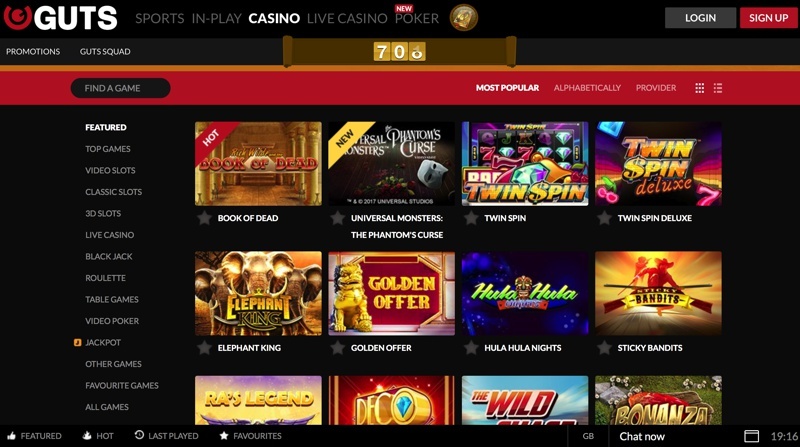 What we will say about the casino is that they have shown a great deal of improvement over the last couple of years and with their affiliation with several software providers, can now really compete with some of the biggest names in the betting industry. Guts Casino has followed the trend that a lot of online casinos do by teaming up with several software providers. These include, but aren’t exclusive to NetEnt, IGT, Microgaming, Betsoft and OMI Gaming. This means that they can offer their customers a unique and custom casino game platform hand picking the best games from each provider. The slots section on the site is absolutely huge and it has to be one of the biggest in the industry. What’s great is that they highlight new games that have been added within the last month, which keeps it fresh, especially for players who keen to return. The vast number of slots can be overwhelming for some and its likely you’ll not even get close to playing them all, but variety is definitely the spice of life and it’s a casino that you’re never really going to get bored of, in terms of volume at least. But, it’s not just slots where Guts have excelled. If you are in to your table games then all the usual suspects such as blackjack, roulette, pai gow, red dog, stud poker and so many more are all on offer. What we found is that because of the several providers of table games, they did range in terms of quality (especially amongst roulette games) but, nonetheless, all were of a more than reasonable standard, with some being excellent. Finally, we wanted to mention their jackpot section, which is another reason why so many people are moving to the casino. The number of games on offer isn’t huge, with about 16 to choose from, but the quality is excellent. The likes of Major Millions, The Dark Knight and Mega fortune are all on offer and all are synonymous with having some of the biggest jackpots in the industry.